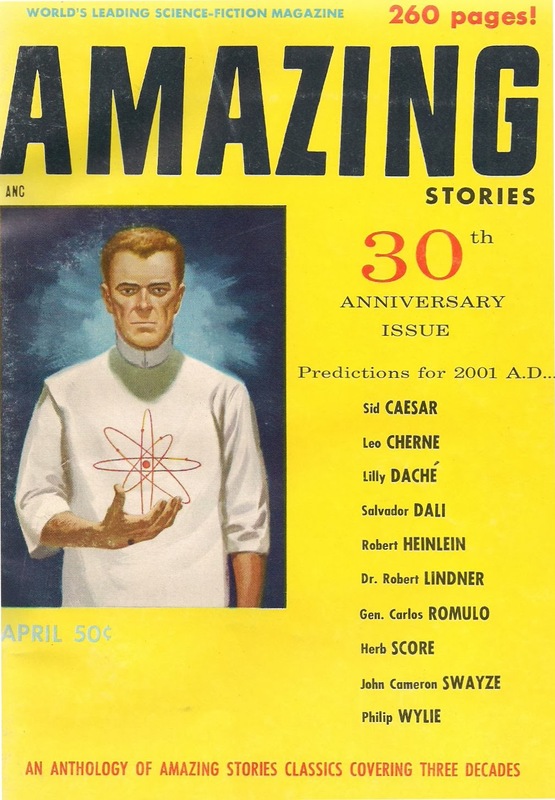 In 1956 for the 30th anniversary of Amazing Stories, editor Howard Browne asked a group of sixteen noted individuals to write about what they thought the world would be like in 2001, then still forty-four years in the future. 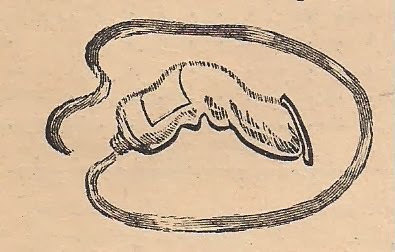 "Since Amazing Stories holds a firm reputation as a sounding board for prophets of the future," they wrote, "the editors have asked a representative group. 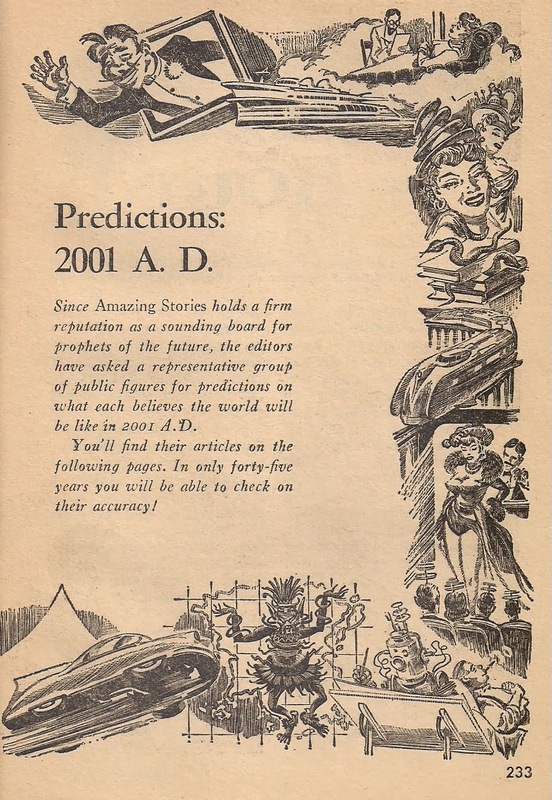 of public figures for predictions on what each believes the world will be like in 2001 A.D.You'll find their articles on the following pages. In only forty-five years you will be able to check on their accuracy!" We present their responses with the original illustrations by an uncredited artist, possibly Leo Summers. William Steig, New Yorker cartoonist and creator of Shrek! A. W. Zelomek, president International Statistical Bureau, Inc.
Dr. N. Gonzalez, director of research at the Eagle Pencil Co.
How well did they do at foreseeing the world we now live in? Read this and subsequent installments of this series reprinting their predictions. Internationally famous exponent of surrealism, Salvador Deli is perhaps the only friend and defender of the rhinoceros. I believe that art and science will have merged by 2001. Art is the reflection of the complete discontinuity of matter ; science is its proof. By 2001, the artists, sculptors, and painters of that day will be able to portray this discontinuity in a new kind of explosive harmony. The secret of this harmony is to be seen today in cosmic radia- tion. All beauty is terrible ; and that radiation is at once both beautiful and terrible is to be seen in the natural portrayal of atomics in the cauliflower and the rhinoceros horn. Beauty is mathematical too—I refer you to the works of Bach—and the beauty of the logarithmic curve of the rhinoceros horn, with its repetition in the internal cedillas of the cauliflower can be seen by the aware eye of today, and will be seen, and acted upon, by the awakened artists of 2001. Nor is this all : cosmic radia­tion, it is now evident, is causing the downfall of the rigidity which for so long has afflicted Man and his works. All things—from architecture, to politics, to gastronomy—in which Man has immersed himself are becoming soft, fluid, ungeologic. By 2001, such things will have lost their final rigidity, and have gained, instead, the unity which is to be found in cosmic radiation, the cauliflower, the rhinoceros horn. They will have realized that the secret of life, of art, and of power is viscosity. As the star of the NBC-TV program "Tonight," Steve Allen keeps more folks awake than caffeine. He is also currently starring in the Universal picture, "The Benny Goodman Story." Television 2001 A.D. should be the fulfillment of the wildest dreams—and then some. I foresee all-color TV, in 3-D (or 4-D), with stereophonic sound, screens that run the length of living-rooms, and co­axial cables that run to the Moon and back. They'll be doing "re­motes" from Mars, most likely, and it wouldn't surprise me to see Pinky Lee emceeing "Life Begins at 80" and NBC doing • "The Wide, Wide Universe." Television comedy should be just like comedy has always been ; people will say that "the new jokes aren't like the old jokes," and some bright young comic will suddenly emerge from any­where and knock 'em dead on the Inter-stellar Network. As for commercials, I'll be willing to lay five to one that people will still complain about them. In case you get impatient, remember that 2001 A.D. is only 45 years away. Visit us again for part two of this series. And visit our website at FuturesPastEditions.com for classic pulp science fiction and fantasy novels and anthologies. This is soooooo cool! Great historic perspective comparing their thoughts in 1956 to today's reality. I look forward to reading more. Thanks for posting this wonderful article.